Each month we recognize a standout provider who has demonstrated excellence across the board. This July, it’s David J. in Detroit! We’re proud to work with the toughest, most hard working guys in the industry. Being a father and owner of multiple businesses, David is really doing it all. We can vouch for him in saying his life is far from dull. David began his foray into small business with his property management company that focuses on renting out multi-family homes and apartments throughout the Metro Detroit area. Managing properties led David to discovering LawnGuru. Having started the company 12 years ago with one rental purchase in Madison Heights, David and his partner have worked tirelessly to build this business. To date, they own and manage 32 rentals, and take care of everything from maintenance to book keeping. Part of his responsibilities are lawn care and snow removal for his tenants. He figured if he was already out mowing and clearing snow at his rentals, why not pick up some extra work using the app to fill in the little bit of free time he had while maximizing profit. In December 2017 David accepted his first LawnGuru service request and has completed 570 jobs using the app to date. There are those people that live to work and David is truly one of them. He’s constantly filling the empty gaps in his day with work related activities to ensure he’s met the needs of the customers he works with and for along with lending a hand to help family, friends and neighbors with favors. 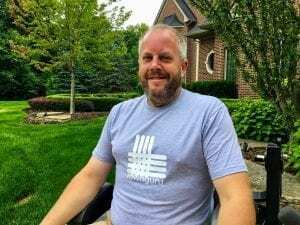 It wasn’t long after he began using LawnGuru when he realized how much money there was to be made, and fully committed to making the platform a component of his income. David invested in his new landscaping business venture by purchasing upwards of $20k in equipment. 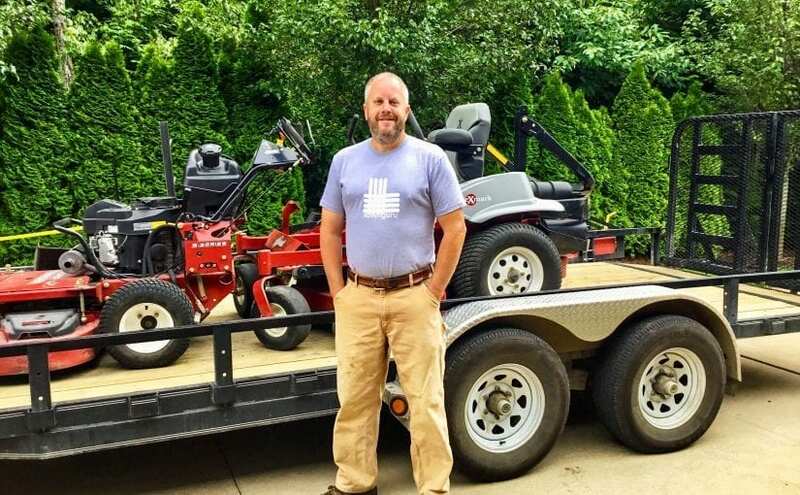 From mowers and string trimmers, to blowers and edgers; David made sure his mow trailer was stacked with top of the line equipment. Upgrading his arsenal to take on more jobs, and complete his route was important to him. David doesn’t settle for mediocrity in any aspect of his life. He’s a go getter and we’re proud he’s part of the LawnGuru family. It’s common for neighbors to flag him down when he’s out servicing and each time he directs them to the app in order to minimize routing and invoicing issues. It can be tricky to bill customers and get payment up front due to the nature of the work, and with a full route David doesn’t want to have to worry about chasing down outstanding invoices. He and his 18-year-old daughter, Vivien, live on a 10 acre horse farm in South Lyon. She recently graduated from high school and heads to Grand Valley State University this fall! A horse enthusiast, and equestrian team member- living on the horse farm has been an incredible place to grow up. Their barn boasts three horses: a Paint, Thoroughbred, and Haflinger. A lover of animals, David and Vivien also have eight goats, five cats, and a dog! In his rare downtime, David enjoys hunting and fishing, specifically salmon fishing Up North and deer hunting in South Lyon. Being a farm owner he loves to be outside and live off the land, working outside in any capacity is a huge hobby for his family! If David isn’t working, or spending time outside, he’s preparing for the next day of work. At home, he has a tool room where he spends most nights sharpening mower blades or changing the oil on his machinery.